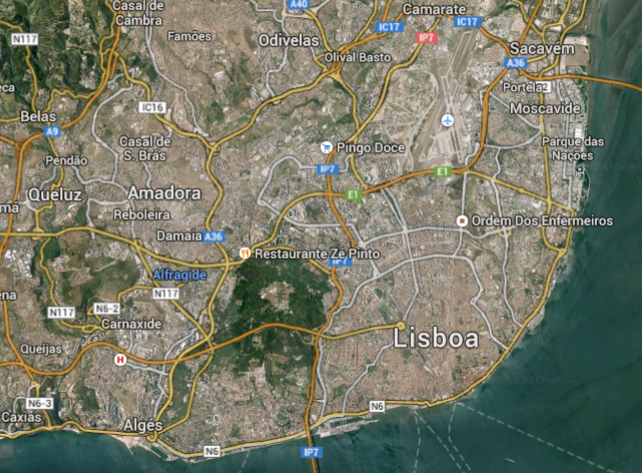 I created this thread to centralize the discussion regarding the development of a realistic simutrans map representation of Lisbon. I have packed a .xcf (Gimp) file with all the layers, and the .png file with the final result. - Something I was wandering was: use different shades of red to represent urban density. This way, using the smooth pencil would lead to higher house density in the center, and lower on the edges. 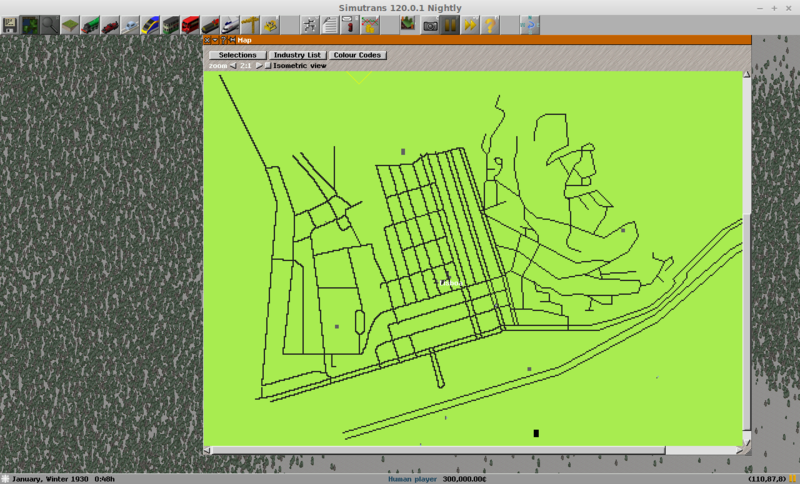 I will continue coding simutrans, to turn those images into a simutrans map. sry I was a bit away in the past days. about having the south margin, well that's going to be hard. Oversized map and/or problems with the bridges. 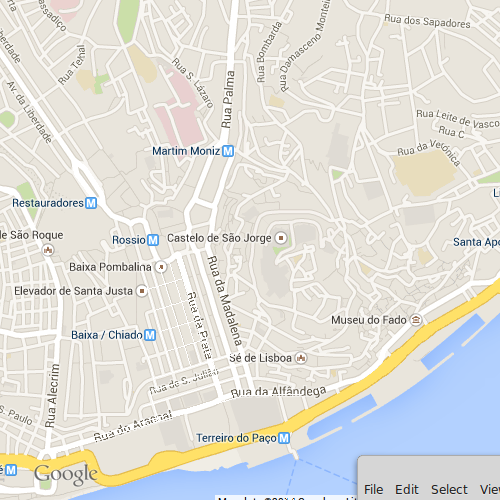 The Ponte Vasco da Gama has 2 turns, which ar not possible to do them here. 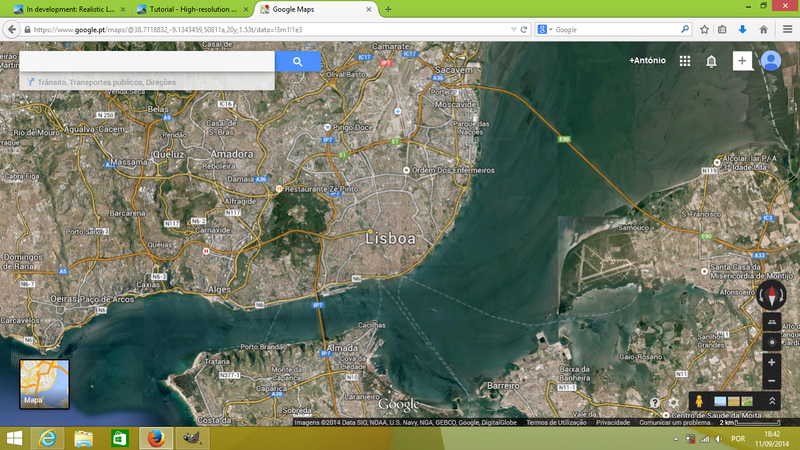 25 de Abril would be easier, but then we would have to show only part of the south margin of the Tagus River. this would be more "practical"
Today I won't be able to do anything, probably tomorrow I will have more free time. I'll test my idea on a region (for example a 1km square) and extrapolate the size of any of those maps. Also I would want to know if it's possible to make the map "upgradable". 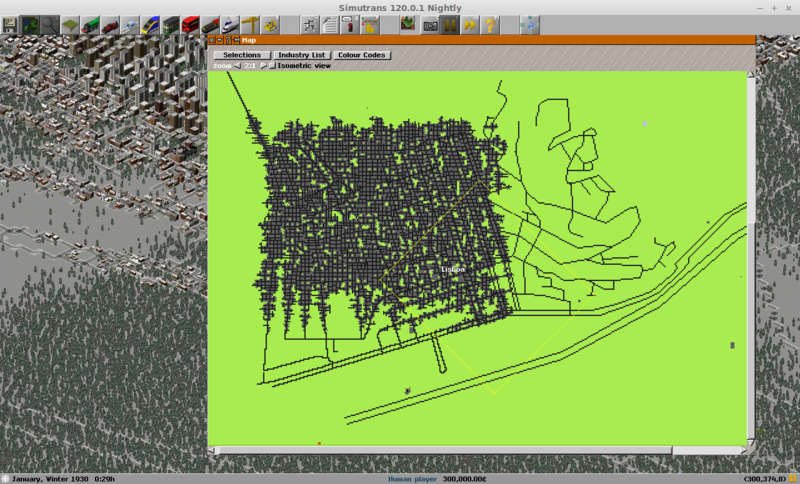 For example: if I would made a 1km square and be playable. Then if I would make a new square of 1km it would just be added. For the regions coordinates it could "shiftable". Was I clear? It makes sense in my crazy mind. If the size of the square is always limited to a specific size, it wouldn't be that hard (i think). If we do this like that we would have a releasable map (but expandable) in a few days. Also it would be easy to do it to new regions. You should not disagree a bit, you should disagree a lot! That was only an example to show you how I wanted the streets. I also think that those buildings should be something like 2*3 pixels. I also agree with you to use N or NE orientation. Once again, it was just to stress that you may choose the rotation you see fit. Not only we can do this, as it is an excellent idea!!! Really!!! You could do the following: Pick a large map, pick a small tile from it (for example, lets make each tile something like 128*128 (just an example, use the size you see fit) and then work on that tile alone. By picking a very large map in the first place, and cutting tiles only after, would make it easier for you to cut adjacent tiles, without discontinuities. Anyway, your idea is just awesome. This way it is even easier to see the results coming out, without having to make a huge map... moreover, when several tiles are finished, players could just select a few of them to make a smaller map. When I am finished with the code, I will help you making some tiles too! and the filenames for each tile. "Stuffmap" is the png we have been talking about. I was going to call it "roadmap", but since it could have more stuff, like houses and green-spaces...you could suggest other names, though. I see you are using windows...do you know how to compile simutrans on windows? If so, I could share the code as soon as I have something ready, so that you could test it....if not, the only way I see I can share this with you, is for you to install a virtual machine (like virtual box) and install linux within it.. I think the community might like this. about compiling... not really. But I have another computer using a Linux OS. So I can test there. But having a Windows ready version would help me a lot. After all, today is going to be a bad day, and tomorrow I won't be able to come here. On Sunday I'm going to have a day off so I might get something done by then. 1st try- plane lines = horrible, I didn't even try to correct the spaces. 7th try I made pixel by pixel trying to make the downtown after a 45º degree turn (facing NE) = better, but still to far from appealing. It doesn't even look like something a city would have. Well, it looks like you are making it too small. How large would be the final city, at that scale? I think something smaller than 3000x3000 pixels is too small. I am almost finishing the code. with my scale calculations it would be around 1000x1000 (with the rotation it gave me almost 1300) so I can try multiplying by 3. but then the blocks in several "squarish" zones of Lisbon we would have 9x9 blocks, which again becomes a bit unrealistic. Couldn't resist to share some results. The code already includes relief data, city-list data, and streets. 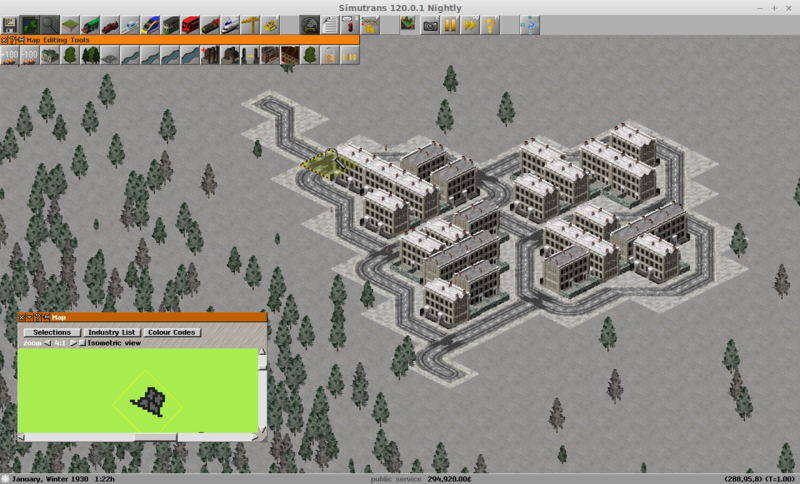 Residential areas still to go. Anyway, the scale I used was way too big. Perhaps halving this would be ideal. Meanwhile, I will try another scales. The maps are simple png's. The relief map is simpler than original's simutrans. Basically, if you want height "10", just paint it with colour (10, 10, 10). Since there are only positive colours, and simutrans supports negative heights, use "relief_map_offset" to set the height for colour (0, 0, 0). x and y are within the corresponding tile. The code will make the adequate translation according to the tile's position. BTW, the numbers in the labels are the X and Y position of the tile. By trying to put the real render to be facing North I by accident put it facing East. And yep, it's too big (that was my problem). I can try to make 5*5 city blocks. it's not double, but it might do. Check how the blocks look like. Also look, if the are now heading north. Hi, Ill test your sample right away, but just wanted to ask you, please, to save the files in png format. otherwise jpg just adds unwanted artefacts (you may see them if you open the jpg and look closely around black pixels, those pixels are not truly white). Png is lossless, and as so does not add those artefacts. Could you please try to compile simutrans on linux? That would help you a lot seeing results, as you could test your designs right away. About the jpg, I'm terrible sry, I normally save it by default in png, dont know why the hell the default is now on jpg.